OMEGA's new High Flow Couplings produce flow comparable to many 1/2" nominal flow couplings in a 3/8” body size. Small body size and lightweight, these single or double end shutoff couplings have a large flow capacity. They replace bulky, heavy brass or stainless steel couplings in many applications. 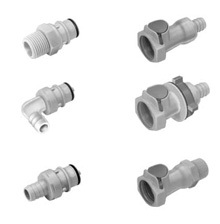 참고: Polypropylene coupling halves do not interchange with other materials.